I used to be a huge tomboy. And because my free time involved being active, my wardrobe consisted of oversized tees and athletic wear. I shopped at outdoor and sporting stores for items that were more about comfort and less about style. But slowly I started to trade in my cleats for stilettos and left the athletic stores behind, never looking back. Recently, I was wandering around downtown with some girlfriends and although I've being disappointed with the lack of retail in the Central Business District in the past, we decided to check out Moosejaw, conveniently located between the new Starbucks and Tigers Stadium. When I think of a store like Moosejaw, I don't typically think of striped tees and adorable sundresses. But I was pleasantly surprised by the selection of lifestyle clothing they stocked (in addition to their usual cargo pants and Toms shoes). 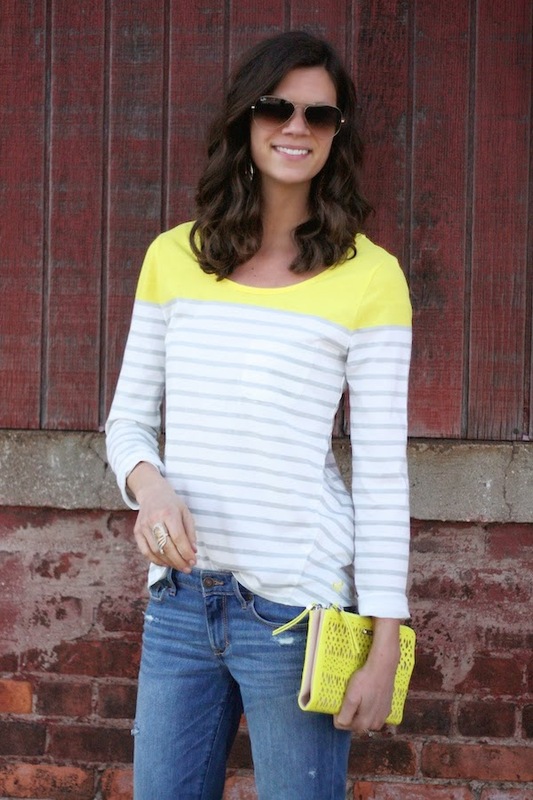 I found this pumped up neon version of the classic striped tee and knew it would be a perfect addition to my ever growing collection of striped shirts. What can I say, I’m a sucker for stripes. And lucky for Moosejaw (and more importantly, my wardrobe! ), I managed to pick up a couple sundresses as well. What can I say, I'm a sucker for second chances too.